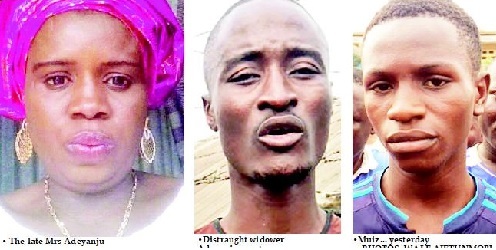 A woman has reportedly died of shock after her son’s arrest by some Federal Special Anti-Robbery Squad ( FSARS ) operatives. Mrs Asiata Adeyanju, 42, slumped and died close to her 9, Ajenifuja Street, Ilupeju, Lagos home on Wednesday night. She was said to be hypertensive. The Nation gathered that the FSARS operatives from Ipakodo Division in Ikorodu, who have been allegedly picking people up in the area in the last two weeks, arrested Muiz, the deceased’s 17-year-old son, when he was about switching on the generator in front of their home. The operatives, said to be in black vests with the inscription “FSARS”, allegedly slapped Muiz and hurled him into an unmarked van. A neighbour simply identified as Emmanuel, a teacher, was said to have been slapped by the operatives when he tried to stop them from taking the boy away. By the time Muiz’s parents, who were in their room, learnt of his arrest, the operatives had whisked him away with others arrested at various spots. It was gathered that the late Mrs Adeyanju ran out with only her wrapper and chased the police van. The Nation learnt that Mrs Adeyanju slumped at a spot. Residents said she died while being rushed to a nearby hospital. Her widower, Musendiku Adeyanju, who was said to be observing his evening prayer at the time of the incident, later met with the operatives at Ilupeju Junction, off Adesiyan Street, to secure his son’s release. The Nation learnt that Muiz was released after the operatives were told his mother had been rushed to the hospital. It was gathered that the operatives hurriedly left the area when they learnt of Muiz’s mother’s death. None of those arrested was taken to the police station. They allegedly secured their release at a price. There was wailing on Ajenifuja Street yesterday when Mrs Adeyanju’s body was brought back home. Sympathisers rained curses on the operatives, describing FSARS as “evil organisation”. Some residents complained that the operatives had been coming to the area for “illegal raids and indiscriminate arrests”. At his wife’s funeral performed by some Islamic clerics, Mr. Adeyanju, 43, was all tears. He described his wife’s death as “devastating agony”, wondering what his son’s offence was to warrant his arrest by the FSARS. He said: “I returned from work around 9:00 p.m., after which my wife served my food. After the dinner, I performed ablution to observe the prayers I missed. I was in the middle of the prayers when there was power outage. My wife instructed Muiz to start the generator in front of the house. “The boy was arrested by FSARS when he was about to put on the set. I overheard one of my neighbours, Mr. Emmanuel, telling the policemen that the boy lives in the house. I had to break the prayers to attend to the situation. Before I got to the scene, the police van had left the spot. We ran after them but we didn’t see them. She confirmed that the late Mrs. Adeyanju was hypertensive. Police spokesman Chike Oti, a Superintendent of Police (SP), did not pick this reporter’s calls. He cut the call after his phone persistently rang last night. He did not also respond to messages sent to his phone.